A founding principal of the United States is the private ownership of land. It is possible that the right to purchase private property was the catalyst to the idealization of the American dream to own your own Home, the Land it sits on. and all of the Rights and responsibilities attached or appurtenant to it - as defined by law. Many people become familiar with land rights when they acquire real estate either by inheritance or through the process of a purchase contract. Most are not aware of the difference between land and the property that is appurtenant to that land, such as rights to improve, use of, the ability to pass it to the next generation, and the management responsibilities & obligations that are a part of or appurtenant to land ownership. In Law, these are separate things. Accordingly, the familiarity with land law remains virtually non-existent as most become accustomed to State statutory regulations relative to the property appurtenant to the land that is own. Another way to state it is that the State / County property taxing, zoning, building codes, etc. are separate from the land, but are based on the ownership of the land. The land mass that comprises Florida is separate from the Government that is located in Florida and are two separate things. The Government within Florida boundaries is there for management of the lands within Florida. and the Florida Government has the responsibility to follow the Law established by the United States Federal Government, specifically the Acts of Congress. As Citizens of the United States, we have rights and privileges that are secured by Law. We are required to fulfill our responsibility to Government as required by Law, just as the Government must fulfill it's responsibility to each of us as required by Law. 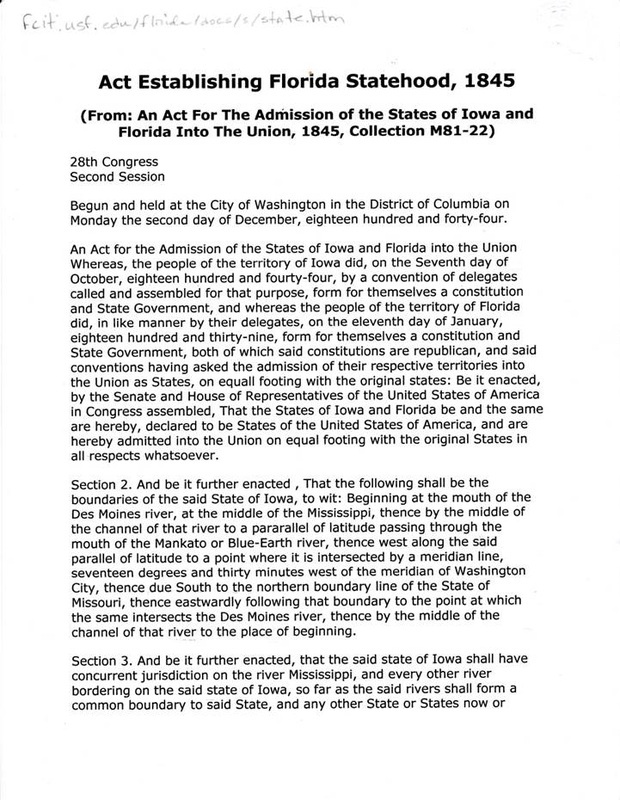 An example of how that works is as follows: "On Monday the second day of December of 1845. the 28th Congress of the United States of America granted the application of Florida's Government, the status of Statehood under the express condition that it shall never interfere with the primary disposal of the “Public Lands” within it." The concept of Law is simple - right vs. wrong. However, it is complicated for a group of persons forming a community to put this concept into practice. The complication is exemplified by our Nation that has one codified system as a body of laws arranged for reference in books for keeping track of the Federally legislated laws, and another codified system of books of legislated laws for each State. The complication continues with separate Federal and State Courts, separate jurisdictions. and districts of authority. Some of the cases may have a judge and jury, and some are heard by a judge solely. All are concluded with another separate codified system of books for keeping track of the decisions that are reached in the quest to define what is right and what is wrong in each case and why. These records are known as “case law” since the courts are unable to make Laws. That task is the job of the Legislators, and is known as the Separation of Powers. The Courts can interoperate Law and cause enforcement of the Law. There are also scholars, practitioners, judges, and laymen, who comment, examine, test, and critique the Law. All contribute to the distillation of what the “Law” is in America each day. 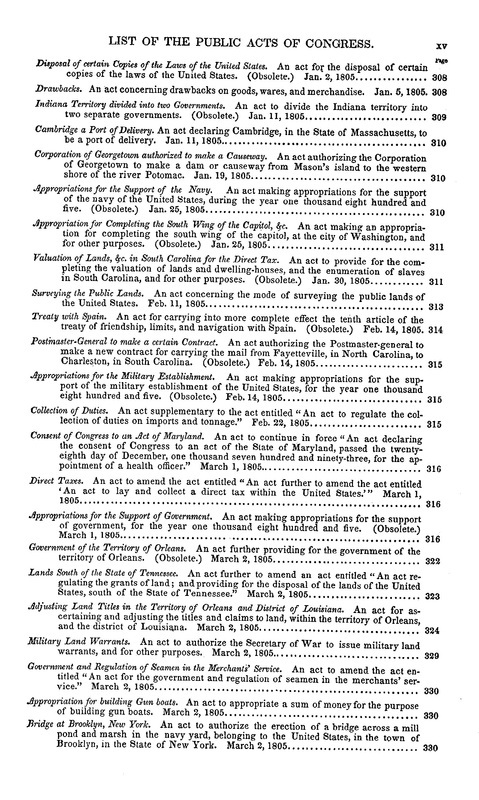 “Land Act of February 11, 1805”. The changes are mostly technical refinements of process and procedure, and not substantive changes of intend. However, Congress decided to legislate “the correctness of the original surveys” in this Act, this Law. 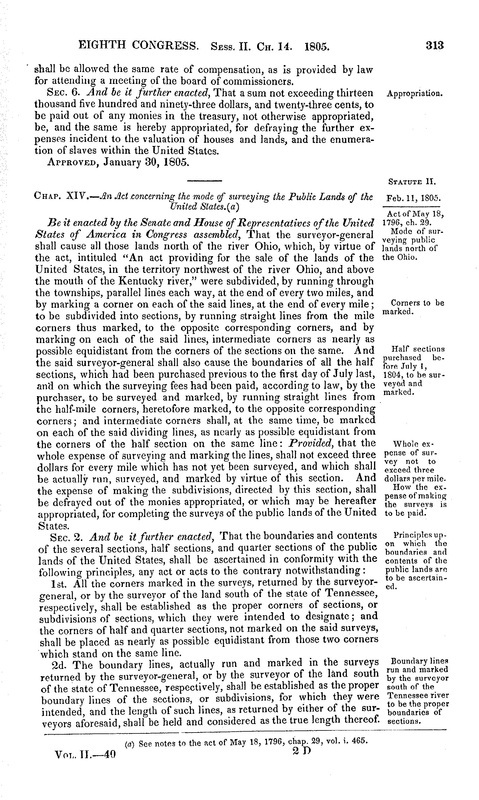 In essence, this act legislated that all original government surveys are correct as to distances, bearings, and area recited on the official plats and in the original field notes and are unassailable except by direct proceedings… . The word unassailable is not defined by BLD but the WD on pg.1543 states it’s meaning as [“1) that cannot be successfully attacked or assaulted 2) that cannot be successfully denied or contested”]. Therefore we assert that this action along with the Constitution, reveals the clear intent of Congress in relation to these original surveys. The surveys were to establish the boundaries of each parcel of land in all “Public Lands States” by a uniform and consistent method, and that once established were not to be changed as they form the foundation of legal land title transfer for as long as the Nation exists. We assert that a Circuit Judge does not have the authority to relocate, move, or change any material fact established by the original government survey of any Township. It appears that only the BLM has the authority, to relocate, move or change any portion or detail of any original government survey that was used to patent land to the public. Even that power is severely limited by Law after property rights have been acquired in good faith- see “Clark on Surveys and Boundaries 7th Ed.”. ARTICLE II His Catholic Majesty cedes to the United States, in full property and sovereignty, all the territories which belong to him, situated to the eastward of the Mississippi, known by the name of East and West Florida. The adjacent islands dependent on said provinces, all public lots and squares, vacant lands, public edifices, fortifications, barracks, and other buildings, which are not private property, archives and documents, which relate directly to the property and sovereignty of said provinces, are included in this article. The said archives and documents shall be left in possession of the commissaries or officers of the United States, duly authorized to receive them. ARTICLE V The inhabitants of the ceded territories shall be secured in the free exercise of their religion, without any restriction; and all those who may desire to remove to the Spanish dominions shall be permitted to sell or export their effects, at any time whatever, without being subject, in either case, to duties. ARTICLE VI The inhabitants of the territories which His Catholic Majesty cedes to the United States, by this treaty, shall be incorporated in the Union of the United States as soon as may be consistent with the principles of the Federal Constitution, and admitted to the enjoyment of all the privileges, rights, and immunities of the citizens of the United States. ARTICLE VIII All the grants of land made before the 24th of January, 1818, by His Catholic Majesty, or by his lawful authorities, in the said territories ceded by His Majesty to the United States, shall be ratified and confirmed to the persons in possession of the lands, to the same extent that the same grants would be valid if the territories had remained under the dominion of His Catholic Majesty. But the owners in possession of such lands, who, by reason of the recent circumstances of the Spanish nation, and the revolutions in Europe, have been prevented from fulfilling all the conditions of their grants, shall complete them within the terms limited in the same, respectively, from the date of this treaty; in default of which the said grants shall be null and void. All grants made since the said 24th of January, 1818, when the first proposal, on the part of His Catholic Majesty, for the cession of the Floridas was made, are hereby declared and agreed to be null and void. ARTICLE XVI The present treaty shall be ratified in due form, by the contracting parties, and the ratifications shall be exchanged in six months from this time, or sooner if possible. (1) This treaty was concluded February 22, 1819. The ratifications were exchanged February 22, 1821, and proclaimed February 22, 1821. Florida was admitted as a State under the express condition that it shall never interfere with the primary disposal of the public lands lying within it. [cite U.S. Congress; 1845 Act of Florida Statehood] From it's inception, the State of Florida and its agent, Walton County, has interfered with the disposal of public lands within the subject Township 1 South 19 West. It appears that all lands within the Township entrusted to and directly disposed of by Florida [some 7269.09 acres] were distributed and managed by various methods that do not comply with the requirements of the U.S. Surveyor Generals Office, or the terms of the express condition cited. These errors have led directly to and are the direct cause of numerous formal legal disputes, inclusive of this one, and countless private conflicts. Several are on-going today. It appears clear that Walton County has encouraged the creative use of the “Quit Claim Deed” as a Band-Aid in coping with the resulting confusion created by this negligence, resulting in more confusion and conflict. In 1977 the State of Florida promulgated FS 177.052 and acknowledged its responsibility and generated a program requiring private surveyors to file certified corner documents. However there is no authentication of these corners by the State as alluded to by FS 177.052. Thus multiple certified corners now exist in different locations for the same corner. The direct result is a perpetuation of the original confusion created by the negligent management and is therefore negligent in and of its self. In an effort to keep this report as brief as possible, only a portion of the research is reflected here, however it clearly and definitively proves the allegation of direct interference. A tremendous amount of additional information is available upon request. Please note Section 7 "on the “express condition”… “that it shall never interfere with the primary disposal of the public lands lying within it”. There is an expressed condition to Florida's Statehood… the survival and perpetuation of the TRS Grid. It makes sense. as it is the TRS Grid which defines by federally recorded survey plats, identifies by monumentation placed in the ground, exactly where, and exactly what is “the public lands lying within them”. Not to mention the fact that the entire State is “Public Land,” as defined by “The Land Ordinance of 1785" and absent is an grant of title from the United States to the Government of Florida of the lands within Florida. In short the Government of Florida is “Management” for the owner - the United States. The State of Florida and by extension Walton County, is obligated by law to maintain the TRS Grids. We are discussing law, and it says “the primary disposal”. Does that mean that when all of the “Public Land” is sold -it’s over? Maybe, as only the proper court of Law can make that determination. However, there is one other thing to know before that question can be asked and that would be: Have all of the “Public Lands” had “primary disposal”? Is there any land in Florida / Walton County that is still owned by the United States and never been patented? 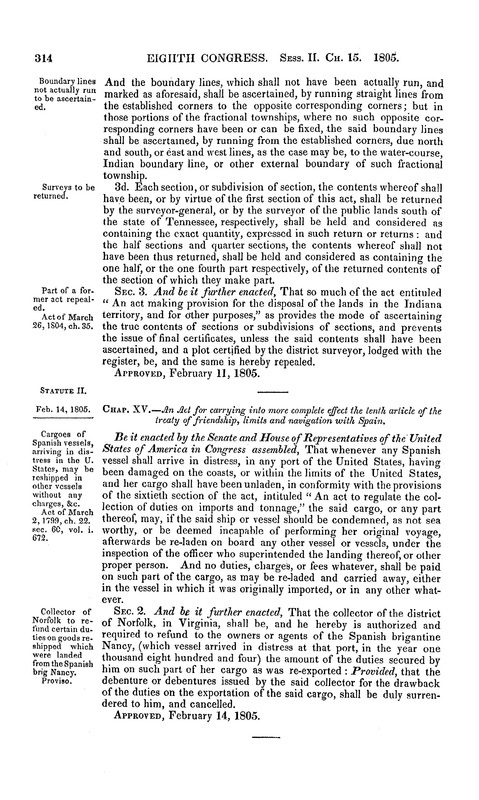 This leads to another question, Even if every inch of Public Land has been “primarily” disposed of by the United States, all of the property rights “acquired” or purchased by the civilians, the land is still directly and forever “tied” to the TRS Grid by Patent to define location and size. Some one in Government has to maintain the TRS Grid, and that would that depend on who sold it. The Township Range System Grid “TRS” was well established and unchangeable, inclusive of error if any, by Act of Congress. Why? Because the United States had already sold land in Florida based on the “TRS” system and you can not have TRS Grid lines moving around. Doing so would result in land fraud and would be a violation of “The Land Act of February 11, 1805” (2 Stat. 313); wherein Congress established the concept that approved governmental surveys are conclusive and without error. In our case there is a direct Federal law, and there is an abundance of Federal case law & State case law that establish the concept that ia County and a State do have to maintain, preserve, and defend the original TRS Grid and the boundaries they establish. In Florida, all property tax assessments and collections are based on the TRS Grid and the State of Florida accepted the responsibility of selling all of the remaining unsold “Public Lands” within as part of a Contract for Statehood. So how can Walton County not know this? By reviewing the public record we’ll soon see what Walton County and the State of Florida has done with the Federal TRS Grid within Walton County. In this way we will attempt to answer this question and some others.We have asserted that the government of Florida and its “actor” Walton County have failed to maintain the original TRS Grid. About 7,269.09 acres of Public Lands within 1 south 19 west were officially, adopted and distributed by the State of Florida. The School Section Rule: (Generally) Lands in Section 16 or 36 within each Township are designated or selected as a “School Section” [only one section can be selected]. Once selected all funds earned from the sale of the public land in the selected Section will go to the funding of public schools in Florida] That means the money goes to Tallassee first and is then distributed to the Counties by the Governor and Cabinet also know as “The Trusties of the Internal Improvement Trust Fund” through “needs assessment’ by and through “appropriations”. The point is all of this is in writing, is clear, is approved, there is a clear meeting of the minds. How can this not be so with the issue of the maintenance of the TRS Grids? Or put another way: How can a Circuit Judge move or re-locate a Federal Section line and thus “move” or re-locate land? We assert that; the Federal Government made it simple and clear but the State of Florida and its “agent” Walton County have been negligent and have broken this law. The General Land Office (GLO) Early Records are available online. The first official survey of Florida was performed around 1840. The original survey notes and plats have been preserved and the Florida Department of Environmental Protection has made these documents available to the public in electronic format. 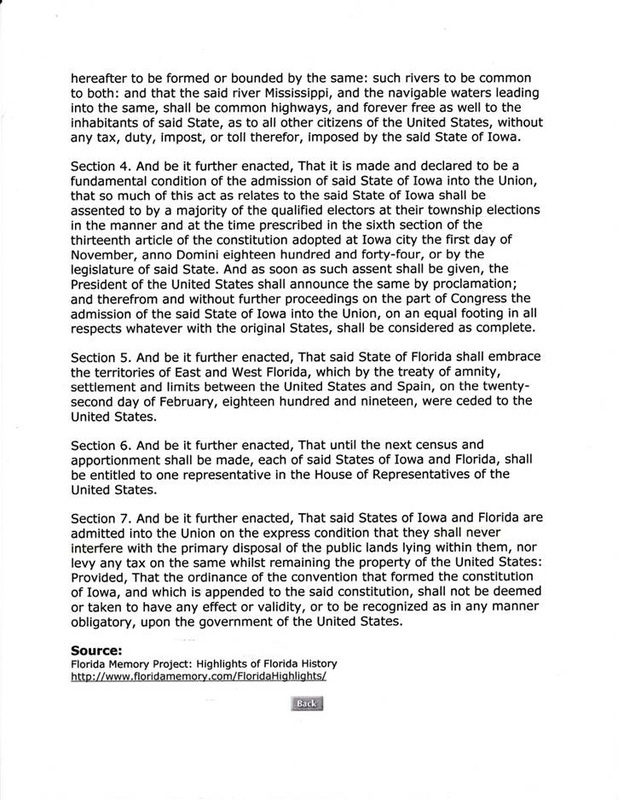 I have the honor to inform you that the state government provide under the new Constitution for the State of Florida, in accordance with the Reconstruction Laws of Congress, has been duly inaugurated and all conditions precedent to the admission of the State into the federal Union have been complied with and our Representatives admitted to Congress. Thus ends the Union occupation of Florida. The terms of Florida’s conditional Statehood remain unchanged and in full force. In 1977, the State of Florida legislated Statute 177.502 as the Legisl﻿ature finds and declares that it is the responsibility of the state, and in the public interest, to provide a means for the identification, restoration, and preservation of the controlling corner monuments established during the original cadastral surveys, to which the vast majority of titles to lands in Florida are related and which they are dependent. All such monuments and evidence pertaining to the original government surveys are resurveys are recognized as historical and economic resources of the state and, as such, are vitally important to the orderly planning, management, use, conservation, and public enjoyment of Florida’s natural resources. In order to implement this policy, the department shall assume the responsibility for conducting a program of the identification, restoration, and preservation of such monuments. The State of Florida created a program called Labins in an attempt to comply with F.S. 177.502, where certification of section corners are to be recorded. However, once again the State relies on the work of private surveyors to provide corner certification to Labins, and does not verify the accuracy of the corner certification. This is not a remedy to the problem, and only supports faulty survey work further by making the corner certifications public, so other surveyors can reference the “certified” corner. Most corner certifications filed with Labins reference living trees that are much too young to be authentic BLM witness trees, and no noted attempt is made at archaeological excavation for the remains of root masses on most to verify a true corner. Each section corner has 4 witness trees listed in the BLM field notes. If the tree is harvested, the root mass below ground can be excavated, similar to a fossil dig. Discolorations, smears, chunks of debris, wood, etc.below the surface is checked for potential accuracy in relation to the monument under consideration. An ideal scenario is to find evidence at 4 of 4 locations identified with the Corner location under consideration. We have one witness location at the ACC monument that is too young to comply with the field notes, according to the results of radio carbon dating on the sample taken. However, this corner has been certified on Labins.